With seven weeks and two days left to B-day it’s a shame that there is not the same movement in Brexit talks as there is involving some of the main actors. A heavy-hitting EU delegation came to Dublin to talk about how the Republic might well manage a no-deal Brexit – effectively how the trains, boats and planes are going to run in a time of confusion. At the same time some of the other key players took off on their own travels. UK Prime Minister Theresa May continues to show the same capability to confuse movement with progress. She finishes her phoney apologia about the backstop in the North of Ireland today, scoots back to London, and is off to Brussels tomorrow for a rendezvous with some of the EU kingpins. Mrs May will meet EU Council President Donald Tusk and European Commission President Jean-Claude Juncker to press her demands for changes to the divorce deal that was agreed on November 25 last. Brussels diplomats remain insistent she will be told in person what has already been conveyed to her officials, and via the international media: that the Irish backstop stops where it is. The UK premier will again be told that the only hope of showing progress is for London to move from its own insistence that Britain must leave the customs union. It’s a standpoint which chimes with the view of the UK Labour Party and many of Mrs May’s own pro-EU Conservative Party members. It would even get a reply other than “No” from the 10 DUP members who prop up Mrs May’s minority government as it would render the backstop redundant. But we are some ways away from that kind of development in the London parliament. Meantime, the EU’s reluctance to yield a millimetre, much less an imperial inch, to Mrs May is compounded by another realpolitik assessment in Brussels. It is that, as she faces another Brexit parliamentary date with fate next week, the judgment is that no EU concession, short of an unthinkable climbdown, would help Mrs May get a positive result at Westminster. But amid all of this disunity, confusion, and stalemate, there is no surprise either that Irish political leaders have taken to the aeroplanes. Taoiseach Leo Varadkar is in Brussels today to meet the EU principals amid signs that pressure on Ireland will continue. 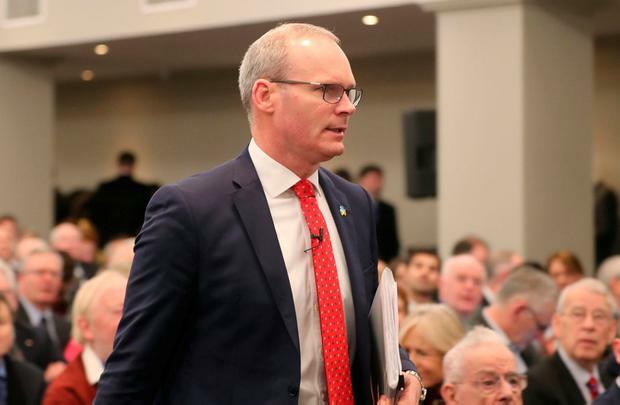 Tánaiste Simon Coveney visits Washington for meetings with senior US officials and elected representatives when he will highlight Ireland’s concerns on Brexit and push for US support. Last week, a resolution was introduced in the US Congress opposing the return of a hard Border in Ireland. Irish-American Congressman Brendan Boyle was behind the move. While US President Donald Trump has been nominally pro-Brexit, he has not been hugely pro special UK-USA special trade deal. So, this US approach does have some potential for Ireland.